Suitmation (スーツメーション, Sūtsumēshon) in Japanese identifies the process in tokusatsu movies and television programs used to portray a monster using suit acting. The exact origin of the term remains unknown. At the least, it was used to promote the Godzilla suit from The Return of Godzilla. 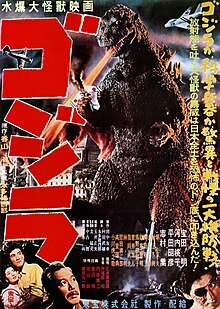 Kaiju (怪獣, kaijū, literally "mysterious beast") productions primarily feature monsters, or giant monsters (大怪獣, daikaijū). Such series include Ultra Q, the Godzilla film series, the Gamera series, the Daimajin series, and films such as Frankenstein Conquers the World, War of the Gargantuas, and The X from Outer Space (宇宙大怪獣ギララ, Uchu Daikaijū Girara). Various movies classified as tokusatsu actually work like generalized science fiction films. These include Warning from Space (宇宙人東京に現わる, Uchūjin Tokyo ni arawaru, Spacemen Appear in Tokyo), Invasion of the Neptune Men (宇宙快速船, Uchū Kaisokusen, High Speed Spaceship), The Green Slime (ガンマー第3号 宇宙大作戦, Ganmā daisan gō: uchū daisakusen, Ganma 3 Space Mission), The Birth of Japan (日本誕生, Nippon Tanjō), The Last War (世界大戦争, Sekai daisenso, Great World War), Japan Sinks (日本沈没, Nihon Chinbotsu, Japan Sinks), Virus (復活の日, Fukkatsu no Hi, Day of Resurrection), Sayonara Jupiter (さよならジュピター, Sayonara Jupitā), The War in Space (惑星大戦争, Wakusei Daisensō, War of the Planets), and Sengoku Jieitai 1549 (戦国自衛隊1549).